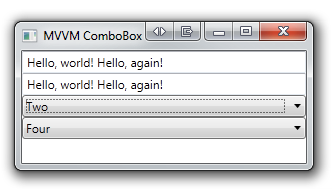 Once upon a time there were four friends – two TextBoxes and two ComboBoxes. They all lived happily on a WPF Window bound together in blissful MVVM harmony. 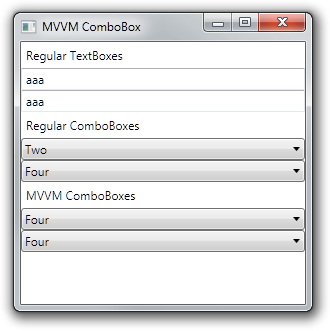 The TextBoxes were bound to the ViewModel’s TextBoxText property and the ComboBoxes to the ComboBoxSelectedItem property. TextBoxText and ComboBoxItem are both Observable<T> so that INotifyPropertyChanged notifications are broadcast properly to all interested parties. ASIDE: Notice the event definition in line 2. By assigned a NOP (no operation) lambda, I don’t have to check whether any listeners are registered for the event. I can simply fire the event and worse case scenario, I execute an empty function body rather than throwing a NullReferenceException. This is tidier in my opinion than the if(PropertyChanged != null) nonsense that we’ve been using for years. The view model is similarly simple. With the INotifyPropetyChanged in place, changing one TextBox will cause its twin to display the same value and same for the two ComboBoxes. So based on business rules, we’ve ignored a change to the view model. The TextBoxes always remain synchronized – reverting back to the previous value if the change is ignored. Unfortunately the changed ComboBoxes becomes unsynchronized with the view model if the view model ignores a change. 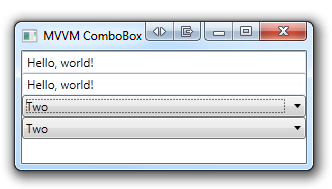 If you examine the view model in the debugger, the TextBoxText is “Hello, world! Hello, again!” as expected. You can change either TextBox as many times as you want. Every other edit is ignored and causes its changes to revert, as expected. Examining the current state of the view model’s ComboBoxSelectedItem, its value is “Four” and not “Two”. I selected “Two” in the first ComboBox, which was the ignored change. The first ComboBox is now unsynchronized with the view model. If you change the selection again, both ComboBoxes have the correct value. The problem is only with changes ignored by the view model. Let’s create a new type derived from ComboBox to fix this problem. I perform the normal OnSelectionChanged event and then update the ComboBox’s SelectedItemProperty from the bound ViewModel if a binding exists. 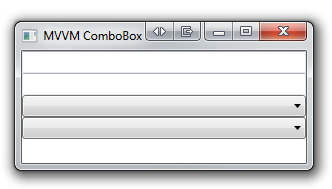 This ensures that if the view model ignores changes or modifies the selection in some way, the ComboBox displays the correct value. Minor note: I am defining a derived ComboBox in my own namespace, which is also called ComboBox. I do this so that in my XAML, I can apply the fix by prepending <ComboBox/> with my namespace <mvvm:ComboBox/>. With this fix in place, my MVVM ComboBox remains synchronized with its view model. In most cases, MVVM model binding dramatically simplifies your WPF code. Unfortunately there are some cases where bugs in the framework prevent it from working properly. Fortunately in many cases you can work around these limitations by simply deriving your own custom control from the one supplied with WPF to fix these problems. For those of you who want to play around with the code, you can find it here. Happy coding! ADDENDUM: As noted by Michael L. Perry in this comment, WPF behaviours can also be used to inject code without subclassing ComboBox. The code sample now includes his behaviour code in addition to the subclassing option. Also to note is that a bug in .NET 4.0 prevents the fix from working. The ComboBox (regulard, subclassed, or behavioured) becomes unsynchronized from the view model. The subclassing code works correctly in .NET 3.5. 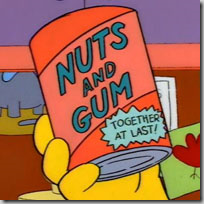 If there are any WPF gurus out there who can understand why it works in .NET 3.5, but not .NET 4.0, I would love to hear an explanation. * NHibernate Loquacious configuration is now a better option for configuring NHibernate IMHO and I use it in all my new apps rather than hibernate.cfg.xml. ** For IoC containers, convention-over-configuration is a better choice followed by code-based configuration. I use XML-based configuration only as a last resort, but it can sometimes be useful for configurable overrides. Rather than typing out the namespace-qualified type name, I simply type PCS for PeppersConfigurationSection and press ReSharper’s Import Symbol Completion (IDEA: CTRL-ALT-Space; VS: ALT-SHIFT-Space). This is fine and dandy if the custom configuration section is defined in your project, but what if you need to specify the assembly name too? ReSharper once again comes to our rescue with a Quick Fix (ALT-Enter). N.B. ReSharper 5.1 and 6.0 EAP (up to at least build 2136) has a bug that causes Import Symbol Completion to fail for files named Web.config in a ASP.NET project. If you rename Web.config to Foo.config – no other changes necessary – you can use Import Symbol Completion. Just remember to rename the file back to Web.config when you’re done. Another option is to copy Web.config to another project type (Console and Class Library both work), make your changes, and then copy back. I have reported the issue to JetBrains here and the team is working on a fix. As developers, we like to believe that only raw data matters. And what is more raw than the written word? Does this mean that email is a more efficient communication mechanism than in-person meetings? Email contains just the raw words of our intent, right? The receiver can scan through looking for relevant content. Their computer can index and search our email. Why don’t we communicate everything in email? We’ve all experienced the miscommunication that can happen in email. So what are we missing? The reality is that humans are social animals. We are attuned to many communication side channels – tone of voice; verbal pauses; facial expressions; body language. These side channels communicate additional information above and beyond the written (or spoken) word. What we are effectively doing with these side channels is increasing our communication bandwidth and when it comes to communication, more bandwidth is better. Just like increasing bandwidth in your computer network means pushing more bits of data per second through the pipe, you can do the same thing with your personal and team communications. Arranging some common forms of communication from lowest to highest bandwidth. As you go from low to high, the amount of information communicated per unit time increases and the likelihood of asking for clarification goes up. You’re much more likely to ask for clarification on an uncertain point when talking to someone than when you’re texting. Having to craft a reply creates a certain amount of impedance and if you’re fairly certain you know what the person is talking about, you won’t send that clarifying text or email. When talking, you’re much more likely to simply say back, “Let me see if I understand what you’re staying” and proceed to paraphrase your understanding of what they said. Knowing why agile teams value daily stand up meetings also helps us compensate when face-to-face stand ups aren’t possible or feasible. Let’s say that we have a geographically dispersed team, video calls are going to have higher bandwidth than a voice call or emails. Similarly if the geographically dispersed team is centred in two different locations, it would be better to have two separate face-to-face meetings linked by video rather than everyone calling in separately via video conference. The team’s goal is to maximize efficient information exchange between team members as much as possible. In each of these cases, successful agile teams use high bandwidth communication to facilitate understanding between team members and with other project stakeholders. Notice that story walls and Kanban boards are a form of non-verbal high bandwidth communication. Team members and stakeholders can quickly glance at the board and see the current status of their project. A well-placed board cannot help but be noticed often and frequently throughout the day. It is a constant visual reminder of what the team is doing and where it is at. It often becomes a focal point of conversation and acts as an information radiator about the project.